Homemade bbq sauce recipe made with blueberries? Yep! 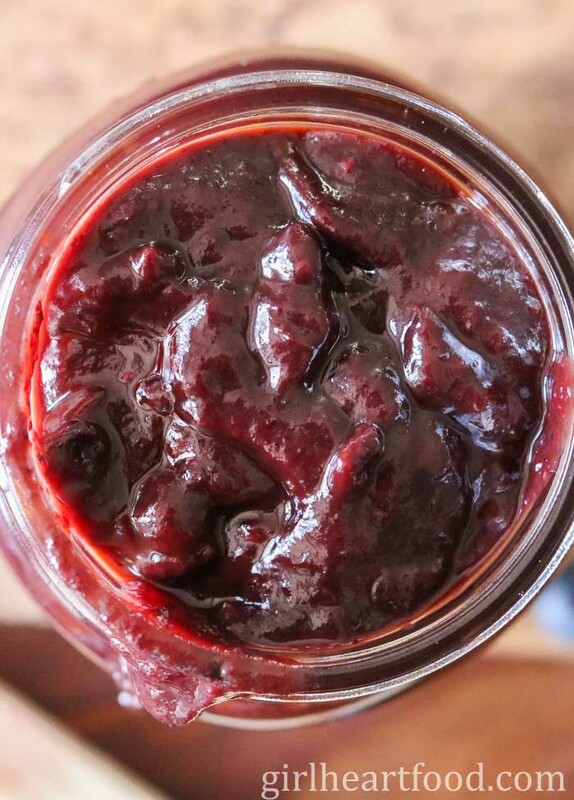 This Blueberry BBQ Sauce is so much tastier than any store-bought bottled sauce. There’s just a touch of spice and a little sweetness…all perfectly balanced. With very little prep and some cook time, you’ll be left with the tastiest homemade bbq sauce that can be used on so many things. This fruit bbq sauce with blueberries was originally posted May 2016, but has been updated with further recipe details. Hey everyone! How’s it going? How was your weekend? Do you guys watch Chef’s Table on Netflix? They just released Season 2 and it’s unreal. I really enjoy that show. For those of you who are unfamiliar, it’s basically a series showcasing various chefs and their restaurants, their stories and some amaaaazing food. I swear, every time I watch that show I get so inspired and it puts me right in the mood to cook. Ok, well I’m usually always in the mood to cook, always in the mood to eat, but even more so after watching this. Some of the food, though, is like art. You should totally check out this show. Do you guys have any show recommendations? Always up for checking out something new, especially when it involves food! Speaking of food, how about more food, lol? It’s so awesome to use ingredients in unexpected or non-traditional ways. Like, making homemade bbq sauce with blueberries! I love experimenting in the kitchen and it’s definitely my happy place. In a heavy bottomed pot cook garlic, shallot and chili in some olive oil for a few minutes. Cover and cook on low for about 2 hours, stirring every 20 minutes or so, ensuring that it isn’t sticking. Then, blitz with an immersion blender or mash with a potato masher to your desired consistency. Use a heavy bottomed pot. Whenever I’m making sauces or jams I find that a heavy bottomed pot works best and stuff don’t tend to stick like it would with a thinner pot. Fresh cilantro stems were added to this blueberry bbq sauce to add a little freshness and something different. If you’re not a cilantro fan, feel free to substitute with parsley or omit altogether. Don’t leave the sauce for 2 hours. Be mindful to check on occasionally and stir so there’s no sticking/burning. Not into spice? Omit the chili peppers if you like (though this isn’t a spicy bbq sauce). If you like things spicier, though, add a little more. As mentioned above, I used an immersion blender to lightly blitz the sauce. If you don’t have that, use a potato masher. Alternatively, just break up with a spoon. Make as smooth or as chunky as you wish. Is this blueberry bbq sauce too thick? No worries! Just thin it out with a touch of ketchup or water, starting with about 1 tablespoon. Be careful not to add too much so that the flavours are diluted. Remember, you can always add more, but can’t take away. Is your blueberry barbecue sauce too thin? Continue cooking until it reduces OR thicken with a cornstarch slurry (use about 1 tbsp of cornstarch mixed with 1 tbsp of cold water. Stir and mix into bbq sauce). What ingredients have you used in unexpected ways? I’d love to hear! It’s always nice trying new things. This upcoming grilling season is the perfect time to try this bbq sauce from scratch. It’s an easy recipe, delicious and there’s load of antioxidants in those blueberries. 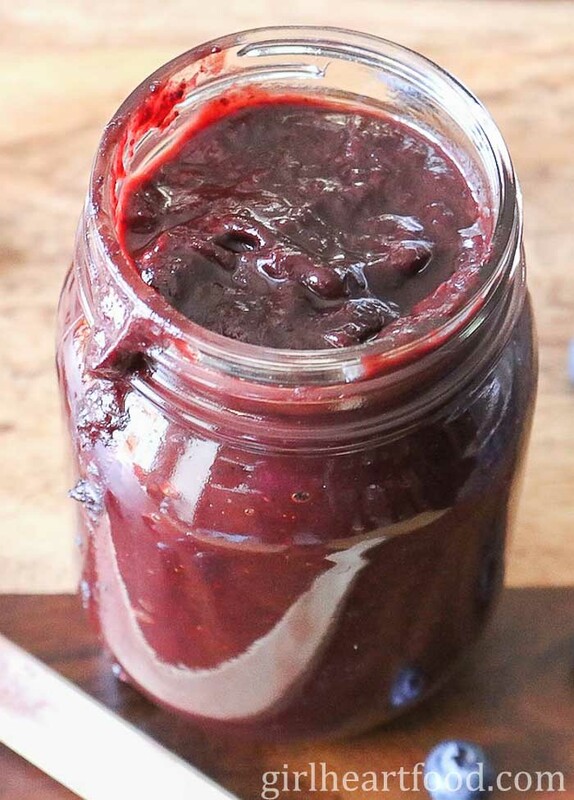 Hope you love this easy blueberry bbq sauce as much as I do. Homemade bbq sauce recipe made with blueberries? Yep! 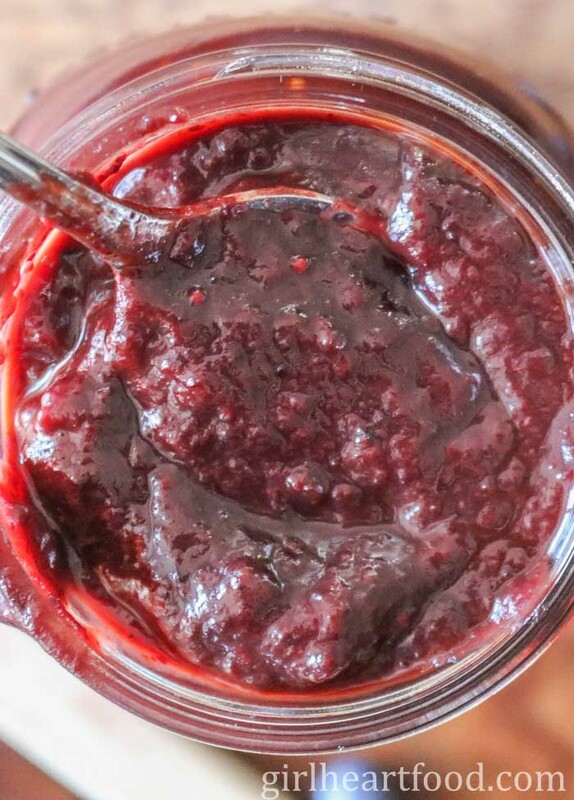 This Blueberry BBQ Sauce is so much tastier than any store-bought bottled sauce. There's just a touch of spice and a little sweetness...all perfectly balanced. With very little prep and some cook time, you'll be left with the tastiest homemade bbq sauce that can be used on so many things. In a pot (I used a small dutch oven), heat olive oil on medium low. Add garlic, shallot and chili peppers. Cook about 5 minutes. Add remainder of ingredients and stir to combine. Reduce heat to low. Cover and cook about 2 hours, stirring every 20-30 minutes. Carefully using an immersion blender, blitz sauce (or use potato masher). I didn't puree a lot because I wanted some texture. Serve with your favourite bbq! See text in body of post for tips. I love blueberry bbq sauce and appreciate that you used a lot of blueberries so you can actually taste them!